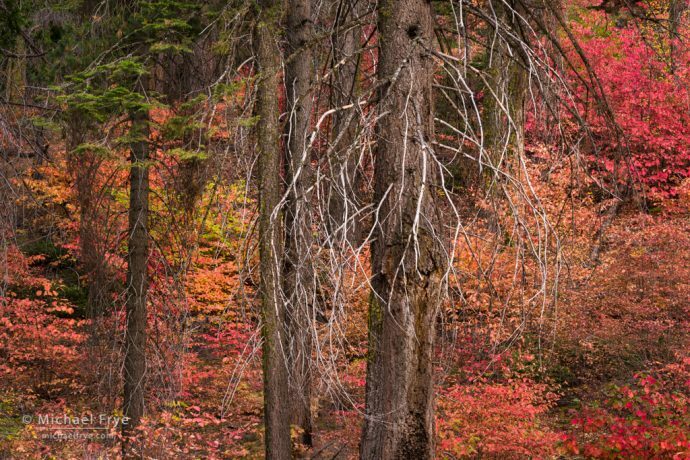 Firs and dogwoods, autumn, Yosemite. Dogwoods have proliferated in this area burned by the Rim Fire in 2013. 116mm, 15 seconds at f/16, ISO 100. One afternoon about ten days ago Claudia and I headed up Highway 120, west of Yosemite Valley, to check on the fall color. We found some colorful dogwoods between the Valley and Crane Flat, but west of Crane Flat most of the dogwoods were brown, scorched by the Ferguson Fire last summer. Or, to be more accurate, they had been scorched by firing operations (back burns) performed by firefighters along the road. We decided to hike down to the Tuolumne Grove of giant sequoias. While the Ferguson Fire didn’t reach the Tuolumne Grove, the Rim Fire did in 2013. The media latched onto this story, with headlines about the fire threatening these ancient trees. 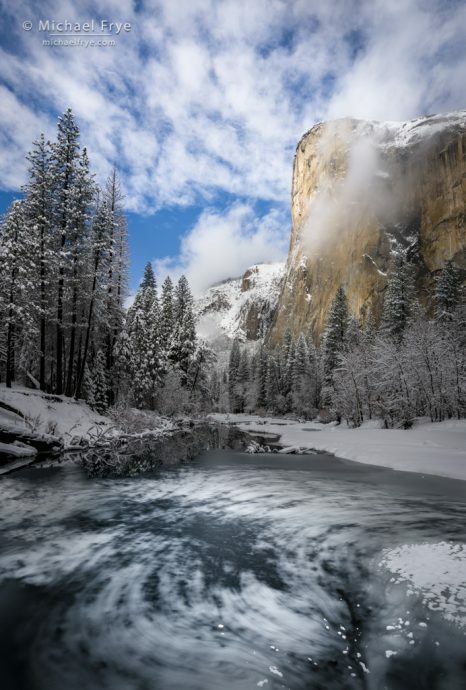 Last winter was a strange one in the Yosemite area, with most of the precipitation coming in March, followed by a big, warm rainstorm in early April that created flooding in Yosemite Valley. That rainstorm melted much of the snowpack below 9,000 feet, so spring came early in those low- and mid-elevation areas. 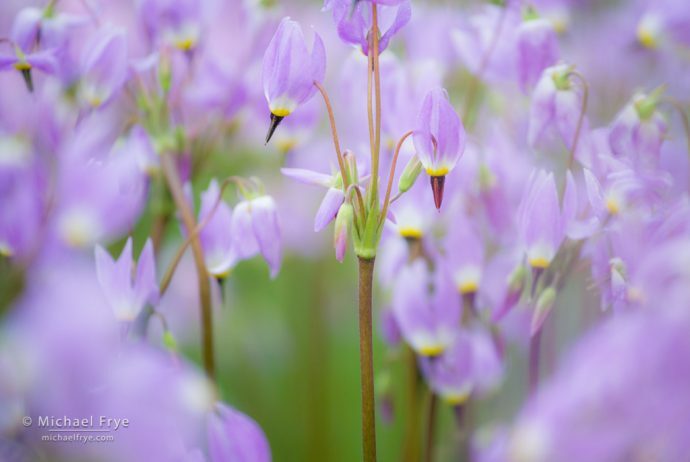 We found some nice flower displays at those elevations, but nothing exceptional. 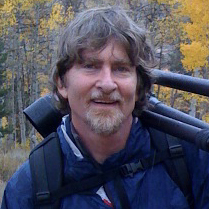 Above 9,000 feet, however, the snowpack remained intact, even after the early-April flood. 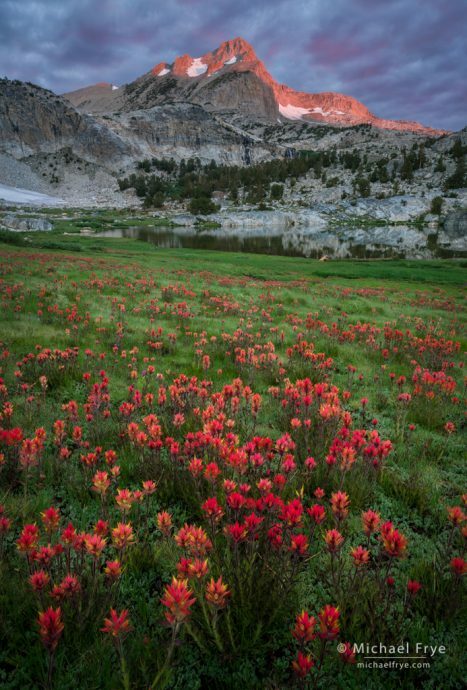 And that lingering snow led to an exceptional bloom in the highest elevations. Back in July, before the fires, Claudia and I photographed the flowers as much as we could, and we also led our Range of Light workshop group to a couple of our favorite flower spots. 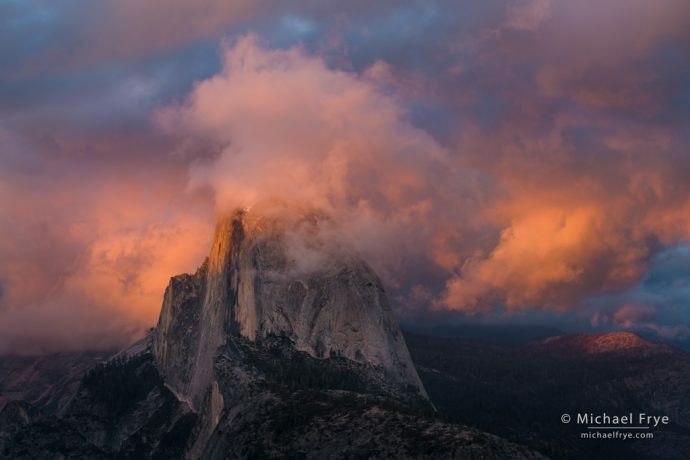 The Glacier Point Road opened early this year – on Saturday, April 28th. Then it closed again two days later due to a chance of snow. When Claudia and I drove up to Yosemite Valley on Tuesday to check on the dogwoods the Glacier Point Road was still closed. 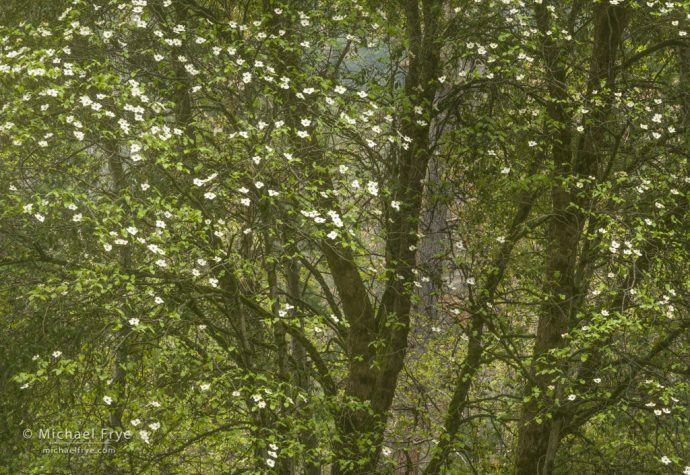 Claudia and I went up to Yosemite Valley yesterday to check on the dogwoods. We had heard they were a bit late this year, but were starting to come out. And indeed they seem to be coming out quickly, and are close to their photographic peak now. Some are still greenish, a few looked a bit bedraggled already, and many seem to be leafing out quickly, but overall they were quite pretty. Some trees weren’t as full as I’ve seen them in the past, but others had more blossoms than usual. Dogwoods bloom for two to three weeks, but I think they’re most photogenic when the blossoms are fresh (like now), and before the leaves get too big (which tends to hide the flowers a bit).